Acer has this week unveiled its new range of high-end products in the ConceptD series which consists of professional workstations, 4K professional monitors laptops and ConceptD OJO virtual reality headset offering users a total resolution of 4,320 × 2,160. Even though full specifications have not been revealed it’s thought that Acer has combined two 2,160 × 2,160 displays similar to that of the HP Reverb headset expected to be made available very soon. The ConceptD OJO has 2.25 times the total number of pixels as Acer’s original OJO 500 headset which had up to 1,440 × 1,440 resolution per eye, explains the Road to VR website. Check out the announcement video below to learn more about the ConceptD OJO headset and other products in the range. 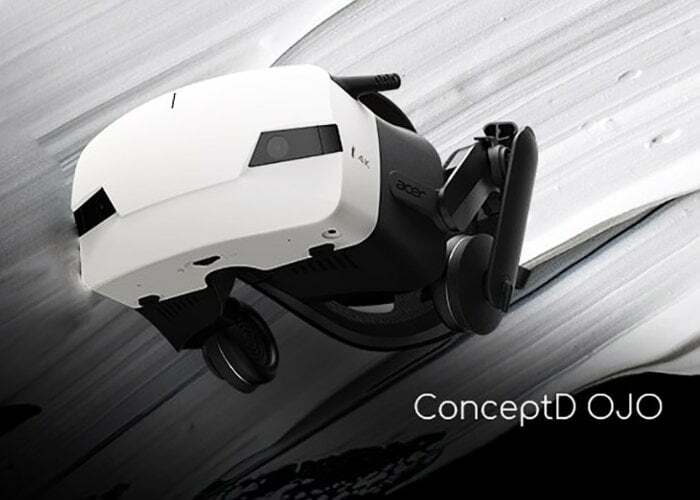 Unfortunately, no information on pricing or worldwide availability has been released as yet by Acer but it is rumoured that the the ConceptD OJO headset will first primarily target businesses and be priced at less than $1,000. In comparison the original OJO 500 headset was priced at around $400 and more consumer orientated. The announcement of the new ConceptD series range of hardware was made during a press conference held in New York by Acer and as soon as more information is released regard specification or other products in the range we will keep you up to speed as always.